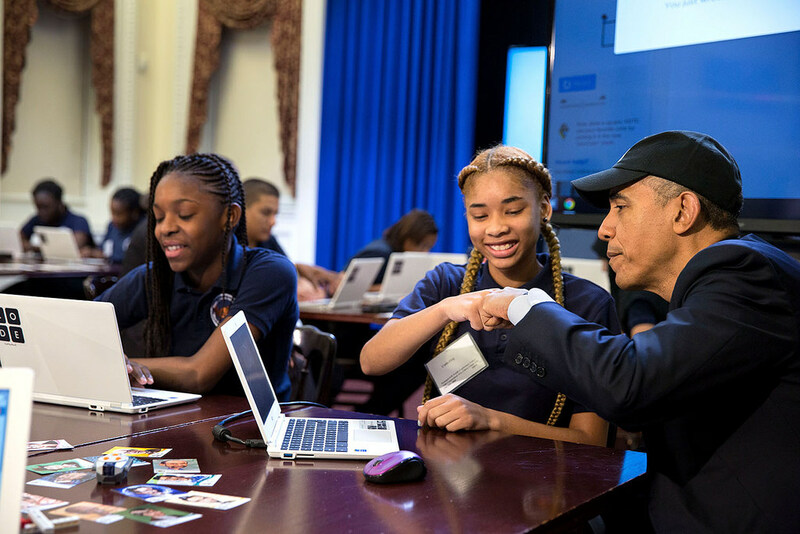 In his weekly address on January 30, 2016, President Obama launched an initiative called Computer Science for All. As the President noted in his address, computer science (CS) is now a basic skill. It is something that nine out of ten parents want taught in their children’s schools, but only about a quarter of our K-12 schools offer computer science. Only twenty-eight states allow CS courses to count towards graduation. The initiative calls for $4 billion in funding for states and $100 million directly for school districts to increase computer science for all grade levels, improve teacher training, and expand access to high-quality instructional materials. The White House fact sheet on the program noted that Arlington Heights, IL High School District 214 is already working to expose all 12,000 of its high school students to CS by integrating it into its math classes. This approach allows students to learn the logic and critical thinking involved with CS while learning math. Coding (programming) is just one of those seven big ideas. The skills students develop through CS help them throughout their academic career: critical thinking, problem solving, computational thinking, and breaking big problems down into smaller pieces to identify the right steps to solve it. With a lack of computer science classes lacking in most schools and with those that exist generally concentrated at the high school level, what can a parent or PTA do to support learning CS? Fortunately, there are numerous resources and programs available, some of which do not even require a computer. A PTA could support an after-school CS club using the resources below or sponsor a First Robotics team. Families can use many of the activities below at home as well. Hour of Code: We’ve covered Hour of Code before, but the activities are available throughout the year. The activities provide some themed tutorials to draw in students through things they are already interested in, such as Star Wars, Minecraft, and Frozen. Also provided are resources for those students who want to go beyond their hour-long activity. MinecraftEdu: While aimed primarily at teachers and schools, non-profit organizations using the software as part of a structured educational program can purchase a license as well. This means your PTA could do so as part of an after-school club, though you would need to work with your school about hosting the software. Computers for Creativity: Run by Sheena Vaidyanathan, a computer scientist and artist turned teacher, Computers for Creativity provides numerous resources, tools, and lesson plans for teaching students that have all been tested in the classroom. Many of these lesson plans can be used at home as well, and a student showcase highlights what her students have done and provides some ideas for your child. Photo ©2015 by the White House under Creative Commons license. This entry was posted in Education News, Illinois Learning Standards, Running a PTA, Tips for Parents. Bookmark the permalink.